Up for auction is this beautiful RM250. Machine was taken down to the frame and meticulously refurbished. Cylinder was removed to inspect. Found good bore so it was honed and re-ringed. New crank seals,clutch, water pump seals and hoses. New brake pads front and rear and added the 1988 rear caliper guard. New chain and sprockets. Exhaust was up graded to the new ProCircuit Platinum pipe with the DG spark arrestor. New fork seals and yellow boots. New seat cover and foam. Carb jetted to 6-8000 feet. Bike had no spark when it came in so theres a new Ricky’s Stator in there with a new coil. CDI box works great. Bike will be sold with an extra..we know how hard these are to find, not to mention expensive. 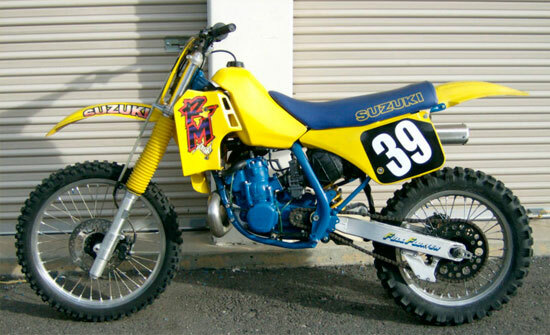 This machine was built to be Suzuki’s Factory Pro Circuit replica. I can tell you it runs as good as it looks! This machine needs nothing to show or go and I’m here to tell you,go fast! This machine surprised all of us in the shop. Light and agile. As with all of our machines, this bike has about a 1/2 hour on it for test and tune. Couple times around the building to seat the rings. You are getting a fresh machine that will give you years of enjoyment. Please ask any and all questions before bidding. I will store for a reasonable amount of time. International bidders, please have your shipper ready. I no longer crate, so keep that in mind.